Here is best "SRI LANKA VS SOUTH AFRICA" , Second ODI match,(South Africa tour of Bangladesh), DREAM11 Predictions for the Fantasy user ,who venue are looking to make a strong team for maximum win. We are providing latest news, match update, information about the match .The team is picked by using various factors on the basis of performance, ground stats and latest form. 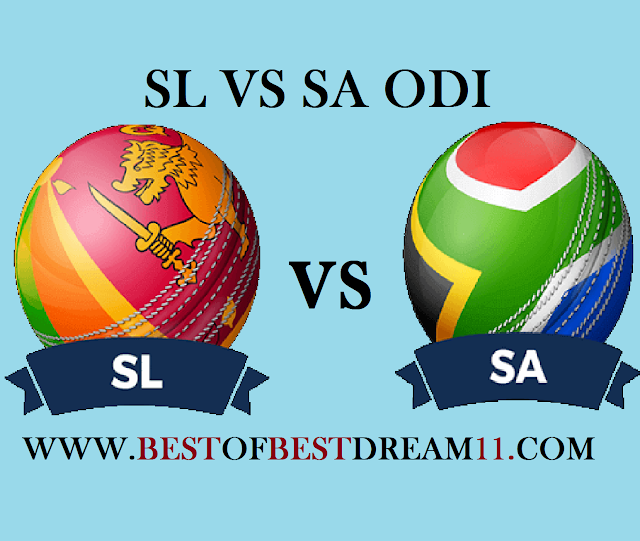 "South Africa are ahead of 1-0 by winning the first match of the five match ODI series.After losing the Test series,South Africa made a huge comeback in the first ODI match and defeated Sri Lanka by 5 wicket. In the first match, the Sri Lankan team was completely disintegrated and all out for just 193 runs.They will try to return to the second match, which will not be easy for them. 1-For Sri Lanka, Kusal Perera (81runs) and Thishara Perera (49runs) played a responsible innings in the last match. 2- U Tharanga, Kusal Mendis and A Mathews will also have full responsibility for batting. 3-in bowling,Akila Dhananjaya bowled superbly and took 3 wickets in the last match. 4-For South Africa ,Q De Kock(47runs),Du Plessis(47 runs) and J P Duminy (53runs) played crucial innings in first ODI. 5-H Amla,David Miller and A Markram will also try to do well in the second ODI. 6-in bowling, Kagiso Rabada(4-41) and Tabraiz Shamsi(4-33) had demolished the whole team of Sri Lanka in the last match.